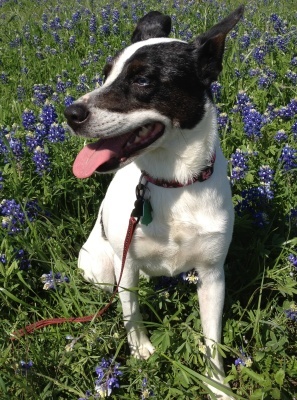 Everyone starts posting pictures of their kids in fields of bluebonnets (state flower). I don’t have any kids, but I do have Lucy. Eileen and I took the dogs to the dog park today, and the field next door was full of bluebonnets, so we figured we might as well. She was more interested in what was going on behind her (in the dog park), but she behaved very well. 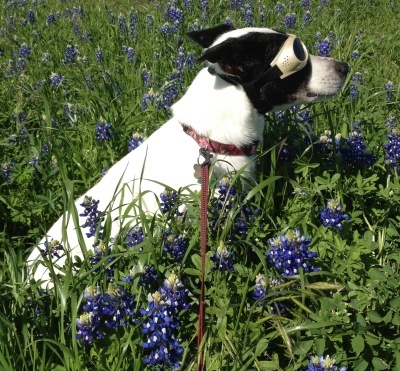 And one more, with her snazzy new doggles on. The last time I had her in the car, I noticed her eyelids flapping in the wind as she stuck her head out the window. Doggles seemed in order. She doesn’t seem to mind them when she’s actually sticking her head out the window, but the minute the car stops, she wants them off! I’ve been very busy with recording lately. I have five ACX projects in process, due between April and August. 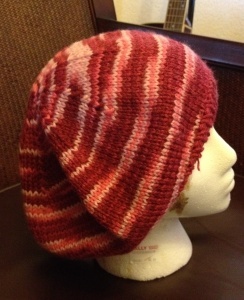 My part of Uncommon Grounds by Sandra Balzo is done. It’s now in post-processing at ACX. I’m still working on Poison in the Blood and Gunnora’s Dragons. I’ve also just started work on the second book of the Summer Chronicles, Forsaken Harbor; and I’ve just been offered The Digital Sea trilogy by Thomas K. Carpenter. 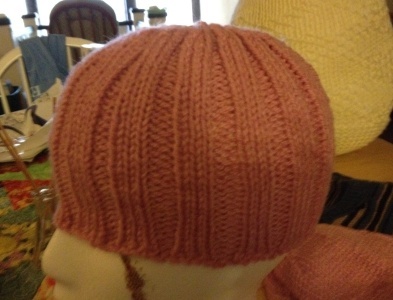 I’ll be starting work on that once I finish the other three. 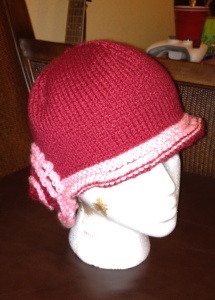 I had to get some dental work done a couple of weeks ago, and during the recovery time, while I was loopy on vicodin, I started working on some simple hats to donate to capsforacure. 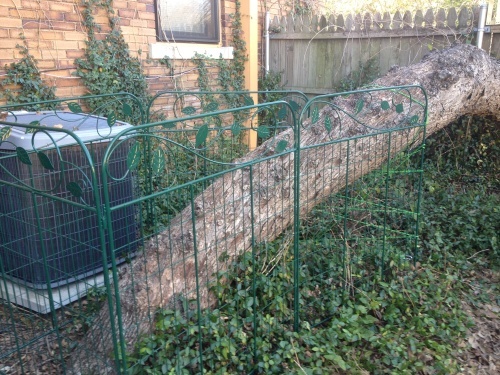 There’s this tree in the back yard that grows almost horizontally for the first eight feet or so, and then, just before it hits the fence, it goes vertical. 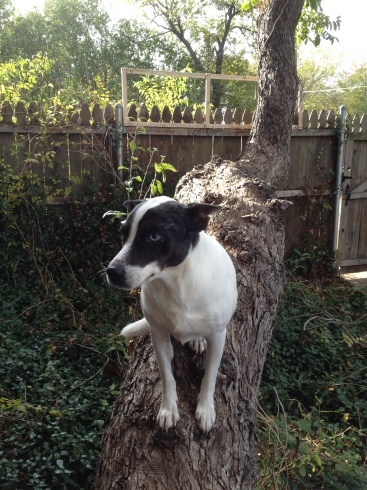 Lucy has always liked climbing that tree and watching the world go by next to the fence. Within the last few months, though, she decided it would be great fun to just jump over and go exploring. 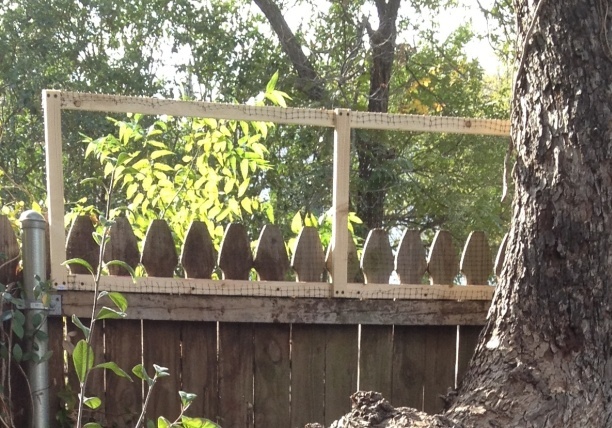 Unsupervised explorations are not on my list of allowed activities, though, so I built a little addition to the fence. This worked for about a month, till she tore the netting and started jumping the fence again. So I tried something sturdier within the frame. Nice and sturdy, but she decided to just go over it. That fix didn’t last more than 24 hours! So now I have to be a total meany and block off her access to the tree entirely. Still, better a meany than splat-dog in the street. 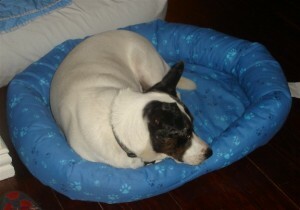 About a year ago, I bought Lucy a new bed. It lasted intact for about three months, I think, then she started ripping out the bottom and strewing the fluff everywhere. 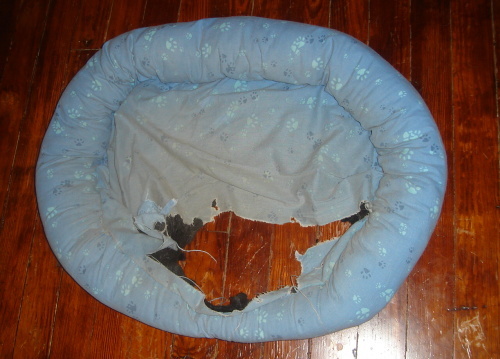 It got a little more ripped one time when she was staying with E’s dog, Huxley. I think they decided it was a tug toy. I’d had it on top of my bedside mat so she wouldn’t be sleeping on the wood floor, but it just wasn’t pretty. 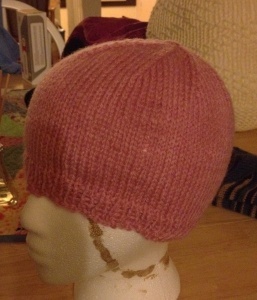 I kept intending to make a sort of quilted bottom for it, to replace the torn one, but I never got around to it. Last weekend I happened to be in Tractor Supply Company and saw a pretty nice sheepskin-ish bed for not too much, so she finally has a bed with a bottom again. Today was a beautiful day! 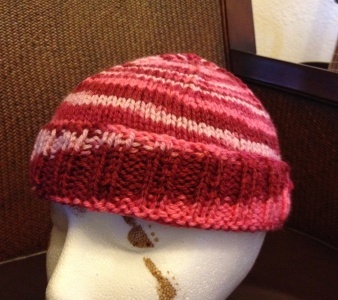 After weeks of cold, rain, sleet, snow (yes, sleet and snow in C. Texas!! Not constant, but still), we had a warm, sunny day; warm enough for t-shirt and shorts, during the warmest part! A perfect day for a little yard work. About eight years ago, our next door neighbours planted a few bamboo shoots along their back fence. Needless to say, there’s bamboo everywhere now. Last spring I was going out every two or three days to cut down the new sprouts that were coming up all over the yard. 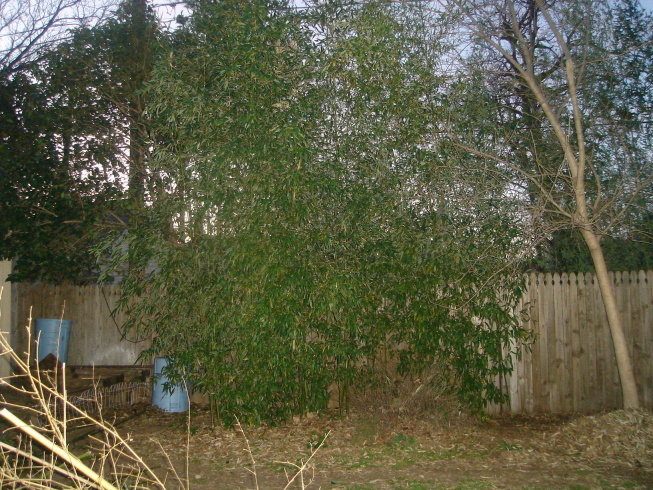 I’d been meaning to thin out the thickets along the back fence for ages; there’s a rosemary bush back there that’s completely hidden in the thicket, and a pretty little tree that’s all but surrounded, but it was hard work with a hand saw, so I never did too much. Another thing I bought while I was at TSC last weekend was a reciprocating saw (cashier had the nerve to ask me if it was a Valentine’s present. Hmpf! 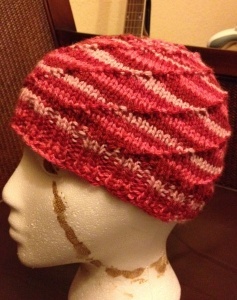 Yeah, sure, Valentine’s present to myself, maybe!). 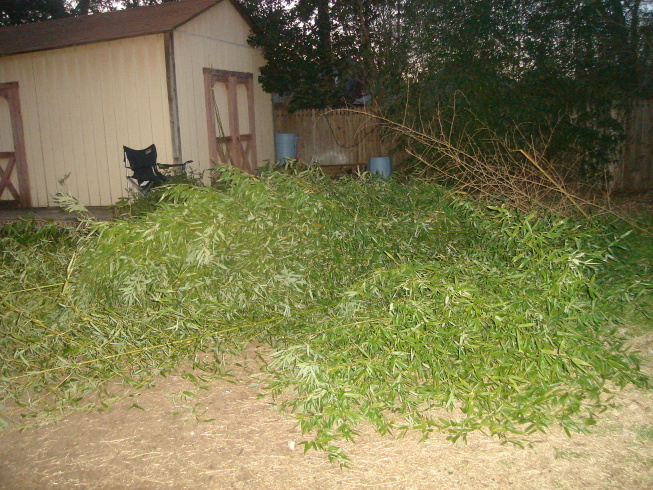 We now have a mountain of bamboo in the yard. 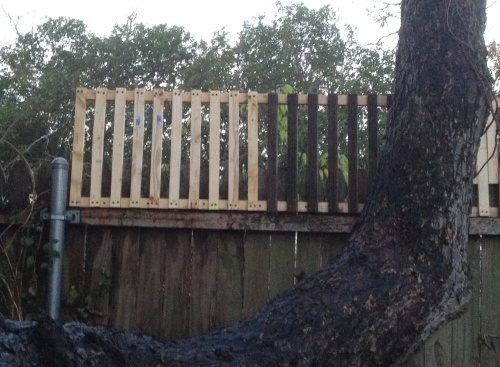 The back fence looks much better now. You can get to the back gate without resorting to a machete, you can actually see that there’s a tree back there, and there’s still enough bamboo to provide shade and privacy. Gosh, look, there’s a door back there! And a tree! 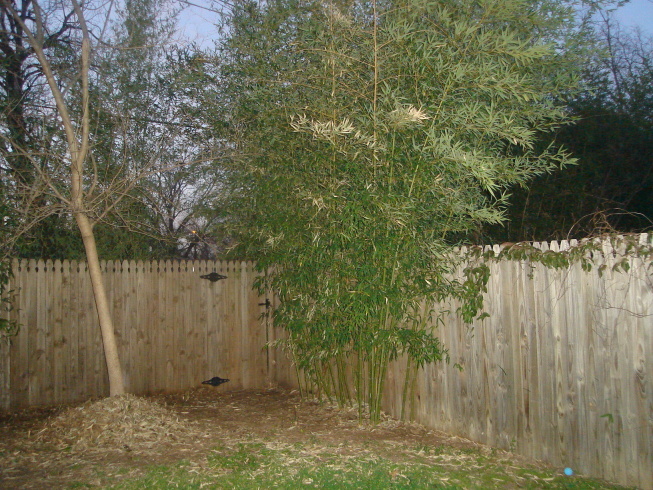 The brown patch in the middle of the bamboo is the poor rosemary bush, which is half dead, but we’re hoping, if we trim it back and stake it down a bit, it’ll re-root and grow back this spring and summer. 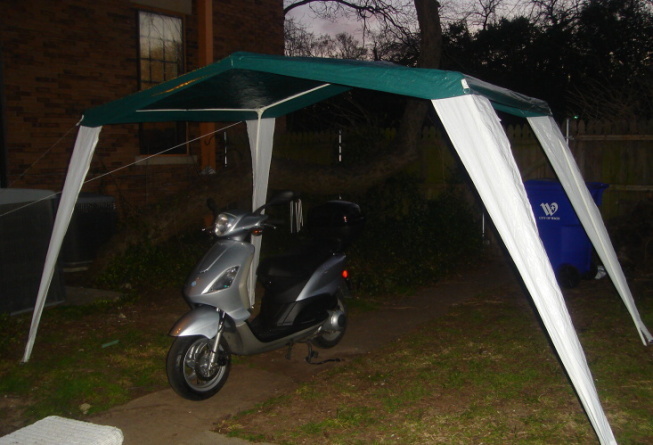 E also suddenly remembered that she had a picnic canopy that was sitting around gathering dust, so she offered me the use of it so I could have semi-covered parking for my scooter. Great fun putting that up, because by that point, the temperature had started dropping again and a fairly brisk wind had picked up. Always the best time to put up tents, when it’s blowing a gale! Finished recording the latest Ignatius book today. Just need to proof-listen the last section and upload it. Those long sections were a challenge, though, even divided up into three recording sessions each. So a few weeks ago, the Cachinnator wrote a post in which he asked whether they still made whole Heath bars, or if they only ever came in crumb form these days. I am happy to announce that I have found the answer to his query. Yes, Cach, you’ll finally be able to get some sleep, instead of pacing the room all night wondering about this. 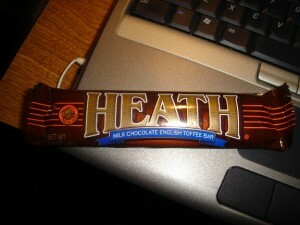 Yes, Virginia, they do still make whole Heath bars. This particular specimen was found at a convenience store in Georgetown. ‘Course, now I have a Heath bar on my desk. I guess I’ll have to eat it. Honestly, the sacrifices I make. 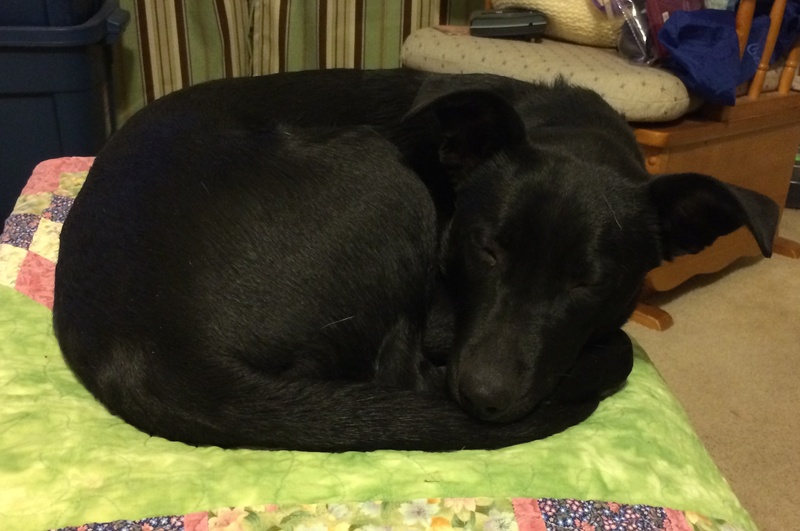 I got Lucy a new bed yesterday, since she has refused to sleep on her cushion (which she used to love) since I washed it about a month ago. I was in Ikea yesterday looking for little tables, and saw a bin full of cheap, Lucy-sized dog beds. She took to it immediately. I’m kind of shocked. It usually takes her a few days at least to warm up to new things. But not this time! She napped in it while I took my nap, then napped some more while I was working on the computer, slept in it (as far as I can tell) all night, and is napping in it again as I type now. I heard back from the publishing company about my audition. They were pleased with my audio (something about the accents making the text come to life :D) and will be calling me within the next few days (all email so far), so fingers still crossed! I picked her up from the local no-kill shelter in mid-September and since then we’ve been getting to know each other, doing some training and going for walks every day. She’s an Australian Cattle Dog mix. 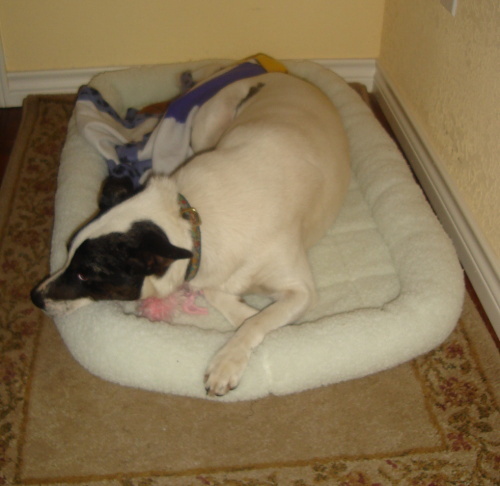 Not sure what the mix is… possibly some sort of terrier or pointer. Other than that, I’d been working on Children of Eden. It was fun, but I don’t think I’ll do anymore shows where Tommy is music directing by himself. He’s much too vague without Lise. She’s got the true teacher instinct (she should; she’s a teacher! ), so she makes certain that everybody knows everything they’re supposed to know ad nauseum. Tommy was all, “I’m going to treat you like professionals, so you just study your music.” All very well, except we’re not professionals, and not everybody could read music! Still, it ended up being a decent show. At one point I’d been interested in directing Dial M for Murder, which came after CoE, but I was having health problems around the time the proposals were due and it just didn’t happen. I might have auditioned for it, but I learned that Scott was going to be directing A Christmas Carol, so I decided to audition for that instead. I was offered the role of the Plain Sister (in the scene at Fred’s house), but around the same time, I got a couple of projects with January deadlines at work and thought it might be safer not to take the part, since I didn’t know how much extra time I might have to devote to them. Tonight I got a call from Beth asking if I would please reconsider and take the part of Fred’s wife (same scene) as they were having a bit of an upheaval in the show and needed all the people they could get. 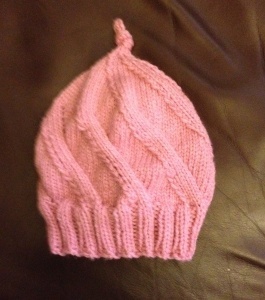 So… three and a half weeks before opening, I’m suddenly in the Christmas show (panic!). Well, at least it’s not a very big part. I’ll get to do some carolling in Act I, possibly be a background person in the Fezziwig scene, and then be Mrs. Fred in Act II. Author kruthie73Posted on Wednesday, 12 November, 2008 Friday, 11 February, 2011 Categories lucy and georgie, pics, theatre6 Comments on I love Lucy!